Despite Fundera’s best efforts to demystify the world of small business lending, the industry can still be a complex and confusing realm. With so many nuances and uncertainties, it’s that much more important for small business owners to be familiar with the financial health of their businesses. In order to achieve this financial fluency, small business owners have to know not only which financial resources to access but also that these financial resources exist at all. 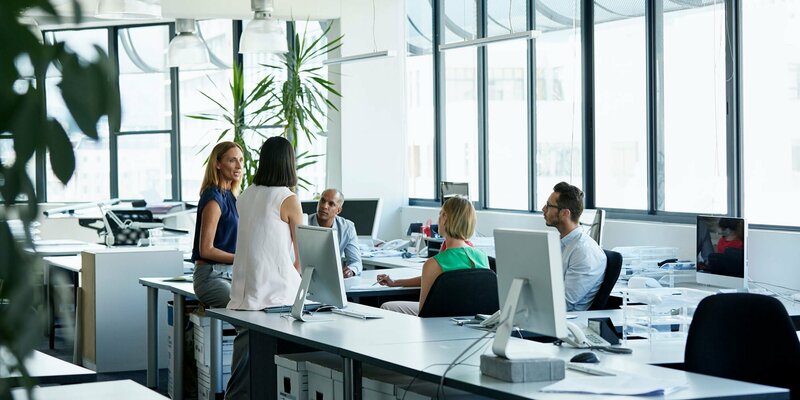 Unfortunately, a significant disconnect exists between these crucial small business financial resources and the small business owners they were created for. Consequently, this makes financial decisions far more difficult than they should be for small business owners. The biggest factor that’s presently clouding small business lending is the post-financial crisis surge of alternative small business lenders. Fundera’s VP of Strategy, Brayden McCarthy (along with Karen Mills, former head of the Small Business Administration) identifies in his working paper on small business lending that tighter restrictions on lending were imposed on banks after the 2008 financial crisis. Because of these tighter restrictions, banks had their hands tied when it came to providing loans to small businesses—providing a space within the small business lending market. Online lenders seized this opportunity and rushed to fill the gap. Now, with a field full of new, minimally-regulated players, the small business lending space has become murky and hard-to-navigate. This lack of transparency within the shifting market of small business loans makes it hard for small business borrowers to know who to trust. Fundera recently conducted a study to learn directly from small business leaders about their experiences with small business credit, lending, and financial resources in this newly established market. Small businesses are mainly applying for offensive financing rather than defensive financing. Despite the usual assumption that debt means business isn’t going well, respondents indicated they are borrowing primarily so that they can grow their businesses. 49% of the small business owners surveyed said “Working Capital” was their most prominent reason for seeking small business financing, and “Purchasing equipment” was the second most referenced reason at 42%. Additionally, 37% cited “Expansion” as their primary reason. These were the top three reasons respondents cited for financing their small businesses.As these answers indicate, small businesses are borrowing in a more offensive, proactive way rather than the defensive, reactive way that many people assume of small businesses taking on debt. Small businesses are still overwhelmingly going to brick-and-mortar banks to apply for financing. Though the entrance of alternative lenders into the small business lending space has been portrayed as a threat to big banks, our respondents indicated that they still look mainly to brick-and-mortar banks for small business financing. In fact, only 10.89% of respondents who sought small business funding did so through an online lender.That’s compared to the 66.34% who went to a large national bank, the 39.6% who went to a regional bank, and the 25.74% who went to a local bank. The buzz about online lenders doesn’t measure up to the bank-centered way in which small business owners continue to go about financing their businesses. A disconnect exists between small businesses owners and educational resources made specifically for them. 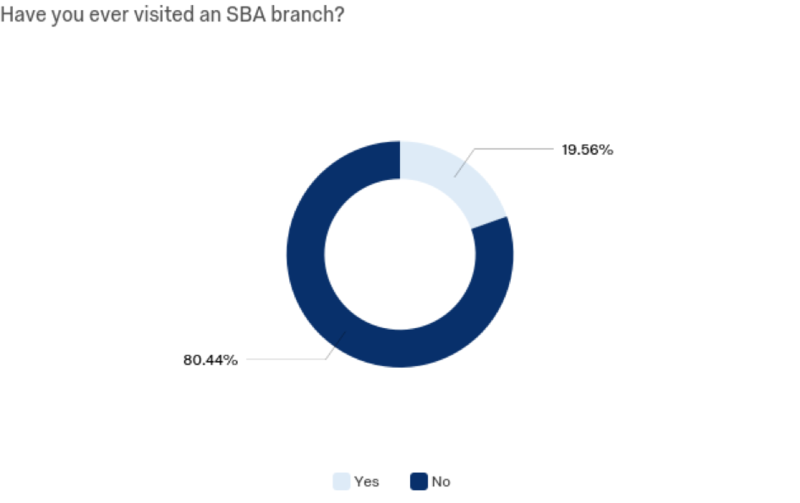 This disconnect materialized most drastically when 80.44% of respondents said they had never stepped foot in their SBA branch, which is an entity that exists solely to cater to their needs. Respondents also indicated a disinterest in small business resources when 34.23% said they were “not at all interested” in seeing a free business credit score for their small business. Clearly, while these resources may need to improve their accessibility, their importance also needs to be stressed more emphatically. Why do small business owners apply for financing? When you look at the business owners we surveyed, they are, by-and-large, successful. 56% of the businesses surveyed had a revenue of greater than $100,000 a year, and 60% of those surveyed ran businesses that had been in business for five years or more. Their endurance is especially impressive when you acknowledge that only half of small businesses will survive past their first five years. Furthermore, 80.6% of the small business owners reported having a personal credit score of 650 or above, one of the most important parts of the business loan application, and 68% reported having a business credit score of 80 or above. Within these demonstrably successful respondents, 50% still had applied for financing for their small business and 20% said that they think about financing their small business on a daily basis. These statistics, side-by-side, debunk the assumption that applying for business financing indicates financial difficulty. In fact, many successful small businesses seek funding in order to finance growth. 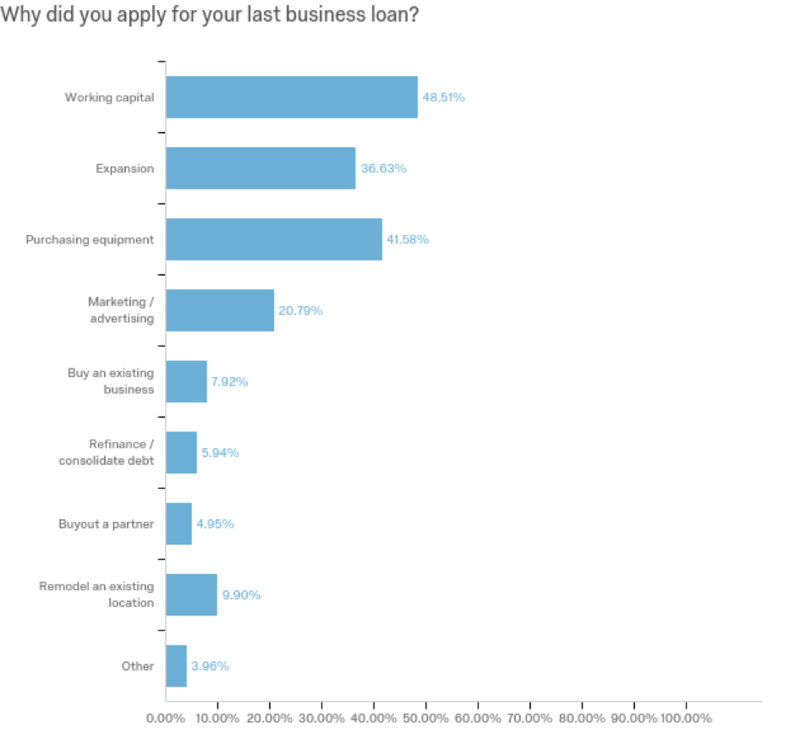 49% of respondents who had sought business financing in the past indicated that their reason for doing so was for “Working capital.” As the second most cited reason for seeking funding, “Purchasing equipment” was referenced by 42% of our respondents. Additionally, 37% of those respondents that had sought business financing cited “Expansion” as their reason for doing so. It seems business owners are looking for funding when business is good—and growing—not when is business is bad. 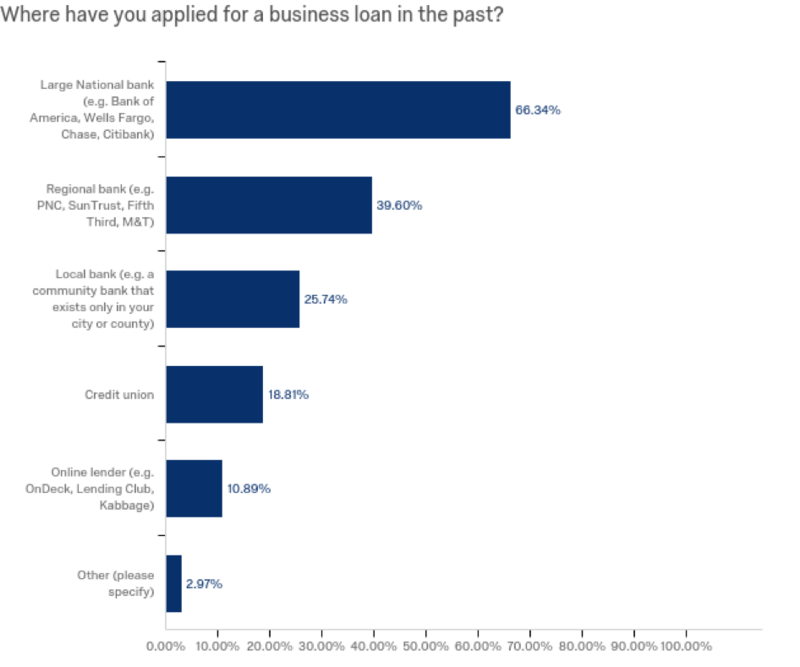 One of the more shocking results was that a mere 5.94% of the respondents sought business financing in order to refinance a loan. Given that refinancing is one of the number one reasons that our customers get funding at Fundera—where we’ve seen business owners save upwards of $15,000 a month—it’s discouraging to see that more business owners aren’t seeing this as an opportunity for financing. What keeps these small business owners from refinancing debt and potentially saving tens of thousands of dollars a month? It could be a number of things—from a credit pull to the very lack of trust mentioned above to just not knowing the option exists at all. How and where are small business owners searching for financing? Since the small business lending industry’s recent shift, the idea that FinTech companies are threatening traditional banks has become a hot topic. And while the financial landscape has certainly diversified over the years, 66.34% of our respondents said they went to the big banks to apply for small business financing and 25.76% said they went to a community bank when applying for small business financing in the past. Even more traditionally, many of our respondents shared that they had borrowed from loved ones, with 66.24% borrowing from family and 36.31% borrowing from friends. Meanwhile, only 10.89% of respondents said they applied for small business financing with an online lender. Clearly, FinTech has not yet garnered the consumer trust that is necessary to become a bigger threat to more traditional forms of small business lending. In fact, in their 2016 Small Business Credit Survey, the Federal Reserve found that the top criteria that small businesses considered when choosing their lender was an existing relationship with the lender. Online lenders simply can’t measure up to the history small businesses have with banks. That being said, our respondents demonstrated a preference for the experience of applying online. 57.23% applied for a business credit card online directly while another 16% applied online through an affiliate like Creditcards.com, Nerdwallet, or The Points Guy. Even more, 16% of our respondents said they hadn’t even stepped into a brick-and-mortar bank branch in the past year. Added to this, statistics from Google Trends show online searches for “business loan” skyrocketing back up to pre-recession rates since December of 2015 after an almost 50% dip. Small business owners want to find a way to finance their businesses online that they’re comfortable with. But with only ~11% going to an online lender for a loan, it seems small business owners let their hesitation towards alternative lenders overpower their urge to use the internet to oversee their business’s finances from their home or office. These numbers, considered together, show us a frontier into which traditional banks ought to consider expanding. 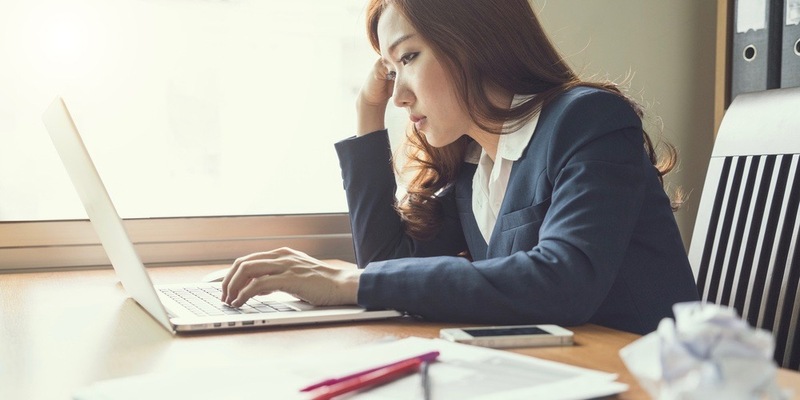 Small business owners, while almost always looking to tried-and-true options for getting a loan, do, in fact, prefer the experience of applying for financing online. It seems it is time for traditional banking and FinTech to collaborate even more. Some banks have started to embrace this frontier. For instance, JPMorgan Chase has partnered up with OnDeck Capital to start providing small business loans. Similarly, the southeastern regional bank Regions has joined forces with online lender Fundation to provide streamlined small business loan processing. The success resulting from these partnerships between big banks and FinTech firms is evident, with over 54% of incumbents claiming such partnerships have boosted their revenue. While big names in banking and FinTech are certainly exploring the potential that comes with the convergence of these two financial industries, it still stands that even JPMorgan Chase, arguably the name that’s furthest ahead in this convergence, only provides online pre-approved loans to their pre-existing online banking customers through its partnership with OnDeck. Beyond this limited reach, no major national bank has an online application for small business loans. For banks and alternative lenders to fix this together makes sense: banks provide their big names and the trust that comes with them while the alternative lenders bring the innovation and the user-friendly experiences. How much do business owners know about the financial health of their businesses? Our study revealed that small business owners aren’t necessarily in touch with the wealth of resources made specifically for them. In fact, over 80% of the small business owners polled had never visited their branch of the Small Business Administration. How does this disconnect affect their small business’s finances? Beyond not applying for debt refinancing, many business owners break pretty standard rules-of-thumb when it comes to business financing. For example, 58.92% of the small business owners we polled use their personal credit card for business expenses. 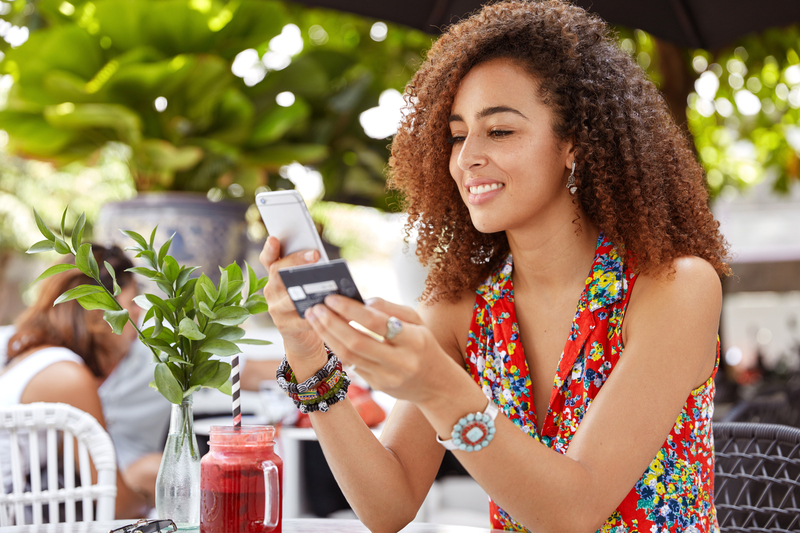 Additionally, though many of these small business owners do check their personal credit frequently, they seldom check their business credit score. Our poll found that 89.73% of those polled checked their personal credit at least once a year. Meanwhile, within the same sample of small business owners, 58.19% don’t check their business credit score at all. 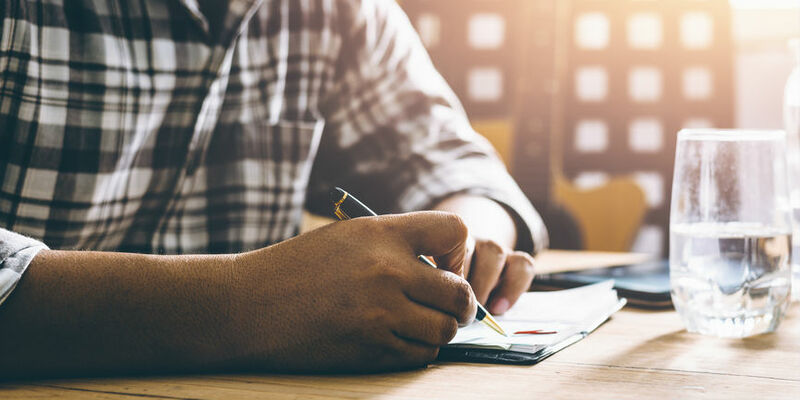 While small business owners demonstrate savviness when it comes to their personal finance, they don’t necessarily transfer this know-how to managing their business’s finances. Is it because they’re not aware of the resources out there that can provide them this know-how? At the end of the day, small business owners need to care more about their business credit scores. While your personal credit score measures your own reliability as an individual borrower, your business’s credit score measures your business’s reliability as a borrower. The business credit score can be a major part of the small business loan application. And, even if business owners aren’t looking for financing, their business credit score will still affect their finances. A strong business credit score can help get optimal payment terms from the business’s suppliers. Currently, a variety of options exist for checking business credit scores. However, many require payments in order to access their full credit reporting services. Obviously, this might account for the hesitancy small business owners exhibit towards looking into their business credit scores. Nonetheless, whether the disconnect between small business owners’ financial literacy and their business finances is voluntary, imposed, or a combination of the two, the disconnect still stands. So what do these insights mean for small business financing moving forward? To start, we need to break the stigma of business financing as a lifeboat for small businesses facing financial hardship. As this survey has shown, small businesses seek financing when they are looking to expand and grow, which are both signs that a small business is flourishing rather than suffering. To do this, we should talk more transparently and frequently about financing as good news for a small business rather than bad. Ultimately, this will encourage small business owners to more readily seek small business financing when their business will benefit from it. With this effort, hopefully, more small businesses will lean toward applying for financing during a financial upswing and, because of this, end up getting better deals on bigger loans. These insights also indicate that big banks need to get online or they will be left behind. As the landscape of small business financing develops with new technologies and platforms, small business owners will start applying their inclination to oversee their finances online into the realm of small business borrowing. The preliminary successes that big banks have seen through their partnerships with FinTech lenders only confirm this prediction that collaboration is the future of small business lending. Finally, the survey shows that small business owners need to take advantage of the wealth of resources available to them. Many educational resources exist specifically for small business owners so that they can be their business’s best financial advocate. With this additional effort to access educational information, small business owners will likely be exposed to far more financial options than they realized they had. From visiting their SBA branch, to saving tens of thousands of dollars a month by refinancing their debt, to improving their business credit score, knowing what’s what in small business finance will allow small business owners to advocate for their business’s best interest. Fundera and Qualtrics conducted a random survey of 409 small business owners and senior leadership at small businesses to examine the state of entrepreneurship in America. The survey was conducted online between May 24 and May 26, 2017. Respondents were asked 79 questions across 5 categories: demographics, credit scores and credit cards, lending, lifestyle, and economic outlook. Certain questions qualified or disqualified respondents from receiving further questions in the survey. 389 respondents self-identified as a “small business owner,” while 20 respondents identified as a “VP-level or above at a small business.” Qualtrics defined a small business as a US-based firm with less than 500 employees.